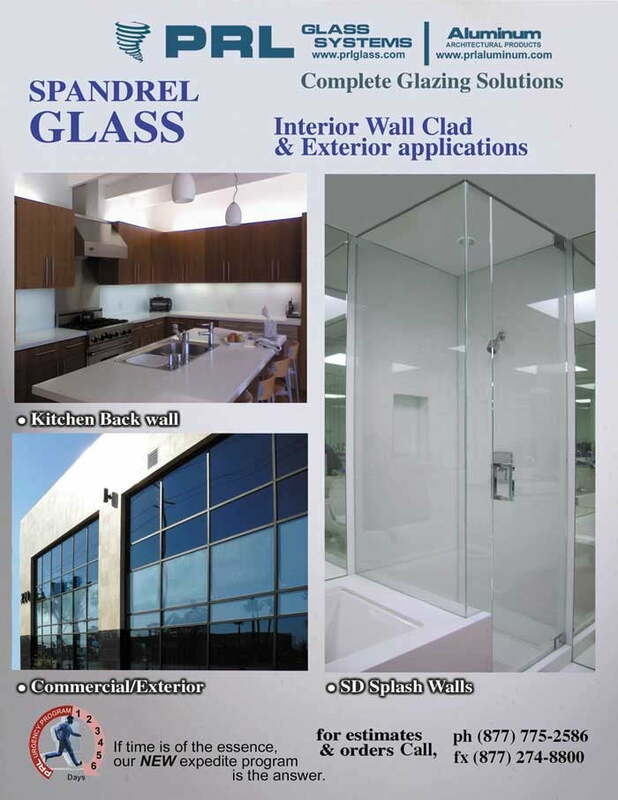 PRL Spandrel Glass is gaining popularity everyday! Painted Glass Becoming Very Popular! This attractive colored glass has become a popular design option for both interior and exterior applications, offering solutions for residential as well as commercial projects. Our Wall Clad Spandrel is used on kitchens, rooms and bathroom back splashes and counters, providing a modern accent of color or as a complete wall covering. It also works great on commercial exteriors as a means of glazing on multi-story buildings, hiding the mechanical components between floors. Since spandrel coating can be used on the back side of any type of glass, it allows architects/designers to harmonize their reflective/tinted vision glass specifications with a complementary spandrel color on the non-vision glass areas. We stock a full line of standard colors with a very fast lead time. An extensive line of custom colors are available with a little more lead time or we can color match to your specific requirements. Please contact our office for assistance Toll Free 800-433-7044.